Another Monday that I come to this space with a heavy heart. Another mass shooting, more lives ripped away and others irrevocably changed. I know we're all sickened and saddened having to talk about it, but -- I think we need to talk about it. Something is terribly wrong, and the longer we turn our heads, the more it will keep happening. Mental health and gun control are two very different, controversial, difficult topics. But they need to be talked about more, fought for more. If you're feeling helpless, here are some ideas. How was your weekend? Ours was quick, but productive. On Saturday my in-laws came over and Steve was able to hang our new foyer light! It's the little things. ;) I got out for a bit in the afternoon and checked out a new home store that just opened by us called At Home. Has anyone else been to one? I'm not sure if I'm just spoiled with other home stores, but I wasn't that impressed. I didn't love the warehouse style and I felt the items didn't seem like the greatest quality for the prices. I think I prefer Homegoods or Kirklands. After I left there, I hopped across the street to the mall and picked up two new pairs of lounge pants for myself at, of all places, American Eagle (I got these and these). I needed comfortable pants that I don't mind stretching out and wearing down as I kneel all over the floor with the girls. Plus, Thanksgiving is coming, so... give me all the stretchy waistbands. Stealing donut holes on Saturday morning. That's my girl. 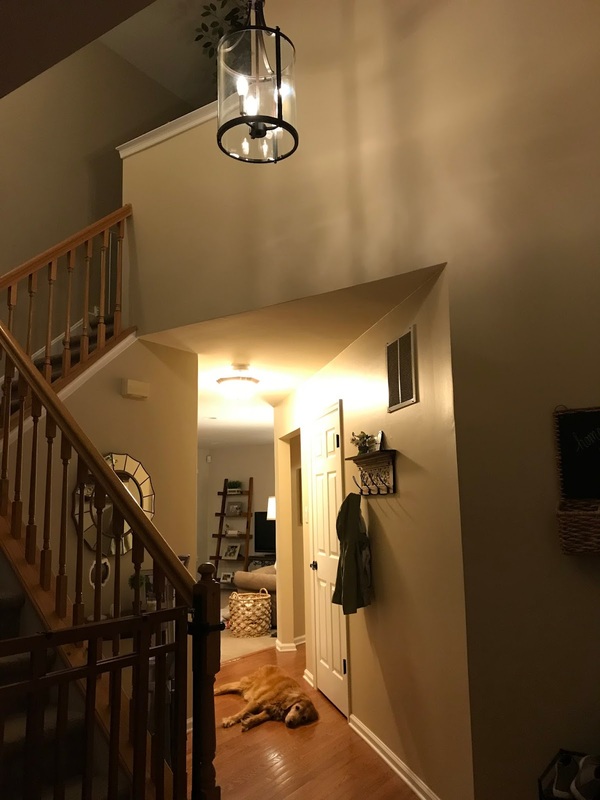 Our new foyer light (so hard to get a good picture since it's a two story space -- I can't grab a good angle! ), and a sleepy golden. On Sunday Carrie had swim lessons and then we just hung out at home the rest of the day, putting away clothes, doing laundry, power washing outside, etc. A little necessary fall cleaning! Today our Hadley girl has been with us for 16 months. It's hard to believe how fast time has gone, and yet impossible to imagine life without her. She is so mischievous and sociable and just full of joy. 1. A NEW FRIEND: I'm thankful for my mommy friends, who are newer. I truly think every mom needs the support of those who are in the trenches, too -- we text all day about our messy houses, the latest news, questions about what to do in different situations, dinner ideas, and so much more. Not sure what I'd do without them! 2. SOMETHING SHINY: I love my Maya Brenner necklace (this is the one I have). Steve gave it to me for Christmas after Carrington was born and it has a "C" on it. I keep meaning to send it in to add an "H" to it, too. I never take it off! 3. SOMEONE UNEXPECTED: I'm thankful for C's gymnastics teacher. She's been such a great addition to C's life and routine -- she's fun and encouraging. 4. 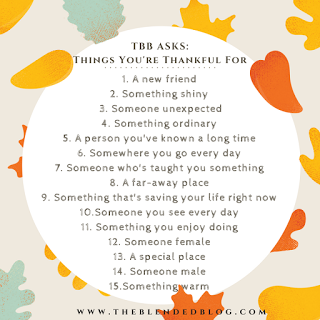 SOMETHING ORDINARY: There are so very many "ordinary" things I say thanks for every day, but today I'll say a warm car on a cool day, the beauty of the leaves changing color, and Christmas music (yes -- I am already in the mood!). 5. A PERSON I'VE KNOWN A LONG TIME: There are too many of these people! Thankful every day for my longtime friends and family. 6. SOMEWHERE YOU GO EVERY DAY: Home. I am so thankful for our comfortable, happy home. Sometimes when I'm coming back from walking Layla at dusk, as we approach the house I think to myself "I can't believe that cozy house with the glowy lights in the bend of the street is mine!" 7. SOMEONE WHO'S TAUGHT YOU SOMETHING: Again, so many of these people to be thankful for. A professor once caught up with me as I walked on the sidewalk and we got to talking. He said something to the effect of, "We are all walking around probably waiting for the first person to say hello, all feeling the same way." I've always carried that with me and now I try to be that person who says hello first. 8. A FAR AWAY PLACE: I'm thankful for the memories Steve and I have made on our vacations to other countries: Mexico, Jamaica, Bermuda. 9. SOMETHING THAT'S SAVING YOUR LIFE RIGHT NOW: That's easy... coffee. 10. SOMEONE YOU SEE EVERY DAY: My babies! So beyond grateful for my daughters. 11. SOMETHING YOU ENJOY DOING: Writing. I love writing in this space, I love writing articles, I love reaching people through writing. It's so therapeutic for me and maybe even helpful to someone else. 12. SOMEONE FEMALE: My momma. We live a couple of hours apart and there's nothing quite like just chatting with your mom. I can't wait to see her this week. 13. A SPECIAL PLACE: Stone Harbor, NJ. It's our little happy place, not too far away from home. 14. SOMEONE MALE: My husband. I'm so thankful we can talk about everything: from little, everyday stuff to life's big questions. Love him so much. 15. SOMETHING WARM: I've never met a blanket I didn't love! Coffee is what is saving all of us now for sure...it's that time of year! You can say that again - especially with the time change! So necessary! Thank you, Regine! So glad you stopped by.